EYES: Blue with a Green rim. + Racial Abilities: Verrin is a K'paur and so has a far longer life-span, larger physique, superior vision, higher regeneration factor, closer tie to the force, and superior bone density compared to the average human. + Integrity: Verrin is a man with a strong sense of personal responsibility and moral principles. He doesn't bend his heart or soul to meet the expectations of others, but because of this, he can be rather uncompromising and inflexible. + Self-Control: All his life Verrin has had to be incredibly careful of his instincts, especially after his puberty, and because of this he has a very powerful self-control. + Appreciation for Beauty and Wonder: Verrin always finds the time to stop and enjoy sunsets, flowers, and artifacts of antiquity. This does lead to a somewhat curious nature and an adventurous spirit as those two are usually what it takes to find real scenes of beauty in the galaxy. +/- Proud: Verrin was taught at an early age of his superiority to most other species and while he no longer believes himself to be superior based upon his race; the pride that comes with believing himself to be more still remains. This pride lets him push himself harder and farther then most other people, but he is incredibly hard on himself holding to a nearly unattainable high standard and sees anything besides perfection in himself as a flaw. - Bloodlust: Despite his training in the Jedi Arts, Verrin has an instinctual bloodlust that he has to constantly fight to control. The sight and smell of blood drives his natural predatory senses haywire, and it takes a lot of his concentration and focus to keep himself under control. It also forces him to constantly hold back for fear of going berserk. - Dark Side Allure: As a K'paur Verrin will always be tempted by the Dark Side stronger then most other people. Because of how he was conceived, there is a hole in his soul that can never be filled with strengthens the pull of the Dark Side. - Outcast: No matter how hard he tries, Verrin always feels that there is something missing, that he never quite fits, that he is never completely happy no matter the situation. His distant outcast like behavior is more akin to a self-imposed exile then being shunned from society. However, due to his recent experiences in being forced out of his 'shell' and talking to not only Jedi Masters, Knights, and even Sith Lords; Verrin has begun to grow more outgoing. While he still feels like an outcast even among 'friends' he is better at talking and dealing with people. - Self-Worth: Despite his pride, Verrin constantly questions his value and tries to find things that validate it such as compliments from others. He is very sensitive to criticism and disappointment which can, if extreme, lead him into depression and make him obsessed with improving his deficiency, imagined or not. Verrin is very large, just like most of his kind, and his height tends to make him stick out of a crowd, but he doesn't have the size to make him truly dominating in a group. His shoulders are broad and his hips are thin, but his build would be considered lanky as large muscles, or well defined ones, are not something he possess. Like a lot of his race, he is pale with dark ebony hair making him, in a certain light, have an almost sickly appearance. His high cheek bones and thin cheeks give him a gaunt look, and it is easy to confuse him with a Vampir. His long, straight hair comes down to skirt the top of his shoulders, a bang occasionally venturing to wave in front of his face. 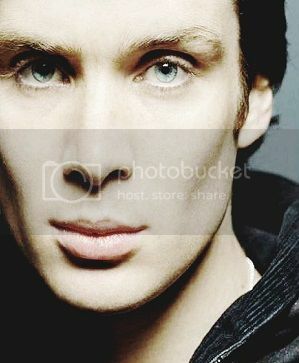 His bright crystal blue, green rimed eyes stare from under dark, thin eyebrows that give him a certain brooding visage. The K'paur are a race that puts high value on complete families and this is reinforced by the Bond that is created between a K'paur and another being when they fall and love and have children. This bond is extremely powerful as it allows the two beings to share thoughts and completes them. It is very rare for a K'paur to be born outside of bonded parents, a pure-blood even more so, but Verrin is one of those unfortunate few. His father, Toralin, was in love with another K'paur, a beautiful K'paur woman named Vess'la, but she did not return his feelings. K'paur are beings of strong instincts and even through they were both Hayi, a people who try to control their urges and natures; sometimes the urge to hunt, to destroy, to dominate becomes too strong. This was one of those times, blinded by primal instinct, Toralin raped Vess'la, a terrible crime and although Toralin was executed for his crimes, the damage had been done. Vess'la was emotional shattered and scared from the terrible crime that had been done to her, more ever, she was pregnant and was now forced to carry a constant reminder of what happened to her for the K'paur do not punish the son for the sins of their father. Without the option of abortion as that was not an option society would allow, Verrin was born with a hole in his soul, as any child born outside the Bond could never be truly whole, something would always be missing; they could never be truly content. Never truly happy. It was a curse that he would bear for his life, the price of his fathers actions. For while society did not blame Verrin for the actions of his father, the genetics of his people did. Verrin grew up like most other K'paur learning self-control, how to control their power, as well as an understanding of the force which most K'paur could feel, many, Verrin included, could feel the force wax and wane around him. But Verrin was always unruly as he always desired something. Some new toy, some new experience; he wasn't sure what he needed as the crimes of his father were kept from him, and so at his age he did not understand why he felt empty, and like most children, he acted out which was hard on his mother who still felt the scars that were left on her mind and body, Verrin was her son, and a part of her loved him because of that, but another part of her saw him as the constant reminder of her pain. As the years past, Vess'la fell in love with a human male, one of the few outsiders allowed on Kanakura. He was a Republic Diplomat sent to improve relations with the mildly xenophobic K'paur race. The human, Tavin, was different from other K'paur with tales of exotic other planets and refreshing ideas that captured her wanderlust, but more then that, with him; she no longer felt the dull ache that had plagued her since the night long ago. In secret, they started to see each other, but once again, fate was not kind to Vess'la as she soon became pregnancy, and there was one thing that was not tolerated on Kanakura, Hybrids. They would kill her and her child for diluting the race, and so Vess'la did the only thing she could do. She took Verrin and ran to Tavin, and together, they left Kanakura to live in the republic. But Coruscant did not sit well with Verrin as the other children on Kanakura could understand and even abide with his more predatory instincts, but the children of Coruscant were not the same, and it wasn't long before Verrin became a 'bully' despite his attempts at controlling his baser instincts, he was still just a child. Tavin contacted a friend in the Jedi Temple, and once the Knight came to their house; it was apparent to him that Verrin was strong in the force, as most of his race was, but also strong enough to be taken into the temple for training. Vess'la let him go after a night of tossing and turning. Her new baby was due to be born, and a deep part of her, one that she had kept a lock on urged her to do it. With Tavin and her new child, she would finally be able to move on, finally be able to live the life she always wanted, but as long as Verrin stayed there would be the constant reminder of her weakness and taint. She gave in to her inner voice and Verrin was taken to the Jedi Temple to become a Jedi. Training was easier for Verrin then it was for most of the other younglings because he already had advanced knowledge and training in sensing and using the force. The problem came with control, despite early training in controlling his instincts; he was just a child and prone to anger and tantrums made worse by his own instincts that only grew worse as he got older. Due to his advanced placement, and the constant tight control he had to have on his instincts; it was hard for him to connect to the other children, and after awhile; he stopped trying. The need for attention that he wasn't getting from the other children soon turned to his Jedi Trainers, but compliments were seldom come by, and he soon grew jealous when others were complimented. Control, barely leashed bloodlust, and the need for acceptance makes for a poor Jedi. It only grew worse as he got older as he hit puberty his instincts went into over-drive, the instincts urging him to hunt and dominate others. Because of this his trainers requested he be held back from becoming a Padawan, so while others became Padawans; he remained a youngling, much to his anger and embarrassment. He had to take special lessons, private tutoring, and isolation in order to overcome his primal instincts. Through private lessons and spars in Makashi his masters hoped the form which required massive amounts of concentration would help him overcome his instincts as well as long periods of private meditation which he has to do on a constant basis to keep his mind clear and remain in control. Finally, at the age of eighteen, he was granted the rank of Padawan. Edited by Verrin Ris'To , 30 May 2014 - 11:53 PM.